NEW COLLEGE STUDENT HANDBOOK This handbook is to help you feel quickly at home at New College and to answer many of your questions before and after you arrive on campus If it does not answer all questions, we hope it tells you where to find those answers easily. Important New College dates for you are the founding October 1 I, 1960 and the en tering of the Charter class of students in September I 964. There are a number of sources where you can read about the brief but fascinating history of the development of the college. New College is so young, though, that you are a part of its history. We hope you will help to make it rich in meaning. What is important is that its founders created New College to fulfill high educa tional goals in the tradition of the liberal arts and sciences Those goals are expressed in the college's educational policy and they guide all of its academic activities. You will be given a copy of the educational policy statement during your first week. 6 College Structure Policies of the college are fixed by a self perpetuating Board of Trustees, made up of outstanding men and women in many fields of endeavor and from many parts of the nation. They meet in November and May while the Executive Committee of the Board of Trustees meets monthly or as ne cessity dictates. The President serves as both administra tive and academic head of New College and he reports directly to the Board of Trustees at their meetings. There are three academic divisions of the college-Humanities, Natural Sciences, and Social Sciences-and each has a chairman and faculty members. At New College there is much crossing of division lines in teach ing and in pursuit of individual study inter ests on the part of students. Administratively, there are offices for stu dent affairs, admissions, business and finance, buildings and grounds, resource de velopment, and public relations. More about some of these later. 10 Orientation Week During your first week on campus you will have an opportunity to acquaint your self with New College, with the nearby com munities of Sarasota and Bradenton, and especially with your classmates. During this week you will be given tests under the direction of the College Exam iner. These tests are to help evaluate your ability and interests so that the fullest possi ble academic experience for you can be ar ranged with your help. Do not try to study for these tests. You will also meet many of the faculty and the administration, and you will be in troduced to the campus by members of the second-year class. Look forward to enjoying yourself dur ing this initial period. There will be social events and opportunities for you to learn to know others in your class and for you to become acquainted with your new sur roundings. 16 Dress Campus dress for students is left as a matter of personal choice and good taste. The student body has set Friday evening meal as a special dress affair when guests, speakers, or entertainers ordinarily are pres ent. Saturdays are casual dress days. Stu dents should understand that their dress. like their conduct, reflects directly on the college whether on or off campus. Meals Three meals are served daily in the col lege dining hall, with the exception of Sun day when a brunch is served at mid-morn ing and then an evening meal. Social Activities Student social life is organized by the student body with the assistance of various offices of the college. 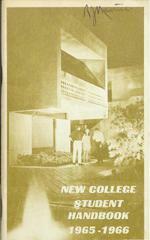 There are no tradi tional events because of the short history of New College. However, during the first year there were teas, dances, hayrides, beach parties, folk dancing, and a number of off-campus trips scheduled for events such as the Sebring races, nearby meetings, concerts, and other activities. You will help to determine the character of the social life by your own organizational ability and your own participation. 22 visory power over all inter-related areas of the college. The second would be a Student Executive Committee which deals with day to-day student affairs. Elections would be held to provide stu dent members for both groups. Faculty and staff members would be appointed to serve with the students on the New College Coun cil. Rules You Need To Know While the Code of Consideration governs much of your existence at New College, necessarily in certain areas specific rules must apply for your own safety and well being, for the preservation of valuable property. or because there are applicable public laws. Library Available in the library is a handbook which tells about book borrowing, books on the reserved list, inter-library loan and other matters. Avail yourself of one of these for it will help you use the library. Fe.el free to consult with members of the library staff; they are happy to brief you on library tech nique and to help you in researching or writing papers and making up reference lists. 24 Vehicles Students are permitted to have automo biles, motorcycles, motor scooters, and / or bicycles on campus. All must be registered with the Dean of Students within 48 hours after they are brought on campus. Under Florida Law students of private educational institutions are exempt from having a Flor ida driver's license or plate. New College regulations require motor ized vehicles to be covered by a minimum liability insurance of $50,000 / 100,000. Authorization may be withheld or withdrawn if a student has a history of acci dents, or if campus regu lations in regard to vehicles are violated. Hitch-hiking Hitch -hiking may seem a handy way to move about the surrounding area without paying bus fares. However, the campus lies within the City of Sarasota, where hitch hiking is unlawful. Buses into Sarasota leave the College gate every hour on the half-hour. Marriage Because all students at New College are in residence and no provisions are made for married students, they are not admitted to the co llege at the present time. 30 the entire period on special study in this area. You must submit a written report OJ; other appropriate evidence of your study at the conclusion of the independent study period. Under special arrangements, you may spend some of these periods at home or elsewhere away from campus Attendance at Classes All students are expected to take full op portunity of the instructional resources of the college by regular attendance at lec tures, classes, services and tutorials. Even though attendance is not regularly recorded, you should realize that much of the material upon which comprehensives are based comes from lectures and class discussions. Transfer Students are not accepted with advanced standing as transfers from other colleges but transfers may be considered at the first year level. Students wishing to transfer from New College can request the College Ex aminer's Office to forward a copy of their academic record and recommendations for course credits to the desired college. Transcripts Before you have taken your series of comprehensive examinations, an informal record of your term grades will be made available as a transcript. After you have taken the comprehensives, your grades on these examinations will constitute your full academic transcript. 32 Money Matters Tuition Payment The tuition of $4200 includes room, board, tuition, and general fees. There will be an additional charge for individual in struction in music and a contingency de posit. The Music Instruction Fee depends on type and hours of instruction and will be determined individually. A contingency fee of $25.00 covers pos sible breakage in laboratory equipment, damage or loss of library books, damage in the residence halls, or key Joss. The amount remaining in this fund will be refunded on graduation or upon withdrawal. A $50.00 deposit is payable in early sum mer to reserve a room for the succeeding year and is applicable to the first tuition payment of the year. Your fellow students have levied a $I 5 student activities fee upon themselves to cover such services as the newspaper, liter ary magazine, social events, and similar ac tivities. The amount will be collected by the college but managed by the students. The Challenging Nature of the New College Program Each student is responsible in the last analysis for his own education. The best education results from the active confrontation of two first class minds. The greater the degree of flexibility, the greater is the likelihood that students will reach the highest levels of which they are capable. Student progress should be based on demonstrated competence and real mastery rather than on the accumulation of credits and grades. The best liberal education derives from mastery of a small number of vital ideas, principles, and modes of analysis. Students should have from the outset opportunities to explore in depth areas which are of interest to them.